Is it a brown bear or a grizzly? All grizzlies are brown bears, but not all brown bears are grizzlies. The grizzly is a North American subspecies of brown bear. The correct scientific name for a grizzly is “brown bear,” but only coastal bears in Alaska and Canada are generally referred to as such. Brown bears are far more numerous in Alaska where there are an estimated 32,000 bears—about 95% of the entire population in the United States. Though brown bears are often perceived as carnivores, they are actually omnivorous. Depending on season, habitat, and region, they can eat grasses, berries, sedges, fungi, mosses, roots, nuts, fruits, honey, insects, birds, and of fish. Brown bears live primarily solitary lives with the exceptions of breeding and cub rearing. Individuals typically stake out a home range. Males have areas of about 200-500 square miles, though some have ranges of up to 1615 square miles in size! Social interactions are relatively rare, however there is a social hierarchy in bear society; adult males are dominant, and females with cubs are dominant over young males and females without cubs. 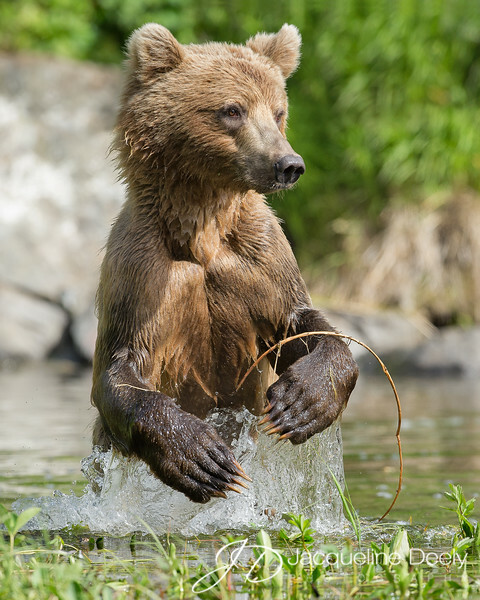 The Coastal Brown Bears at Wolverine Creek are only accessible via floatplane out of Soldotna, Alaska. This solitary juvenile attempting to catch a salmon was approximately three years old and learning how to fend for itself in the wild. As it suddenly pounced through the water, I was ready and waiting to capture the action and excitement of the moment!